With a stay at Rüters Parkhotel in Willingen (Ortsmitte), you'll be a 4-minute drive from Sommerrodelbahn & Sesselbahn / Skilifte Willingen and 11 minutes from Lake Diemelsee. Featured amenities include a computer station, complimentary newspapers in the lobby, and dry cleaning/laundry services. 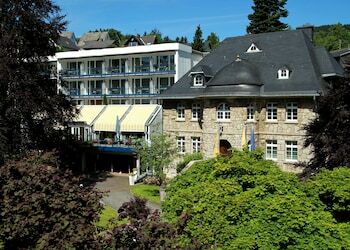 Planning an event in Willingen? This hotel has 1453 square feet (135 square meters) of space consisting of a conference center and meeting rooms. A train station pick-up service is provided at no charge (available on request), and free self parking is available onsite. With a stay at Apartmenthaus Seetempel in Haffkrug (Ostholstein), you'll be within a 10-minute drive of Hansapark and Museum fur Regionalgeschichte. Free self parking is available onsite.